The Comprehensive Spinal Cord Model has color-coded nerve roots for easy identification. The upper thoracic spinal cord is rendered in longitudinal and cross section and enlarged six times to show dorsal and ventral nerve roots with ganglia as well as the blood supply. Each type of nerve has been painted a different color: afferent visceral nerves, green; afferent somatic nerves, yellow; efferent visceral nerves, red; and efferent somatic nerves, black. 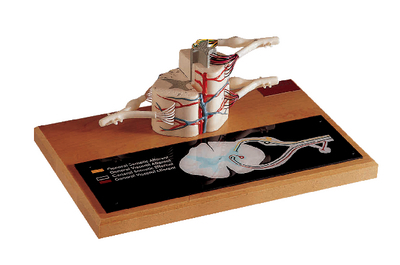 The model is mounted on a base, which features a circuitry diagram.